Most of the time, blog entries here will be advance heads-ups to imminent arts events, but occasionally an after-the-fact recollection will find its way onto the page. Last night, the locally-based choral Woodley Ensemble performed in the Coolidge Auditorium at the Library of Congress. 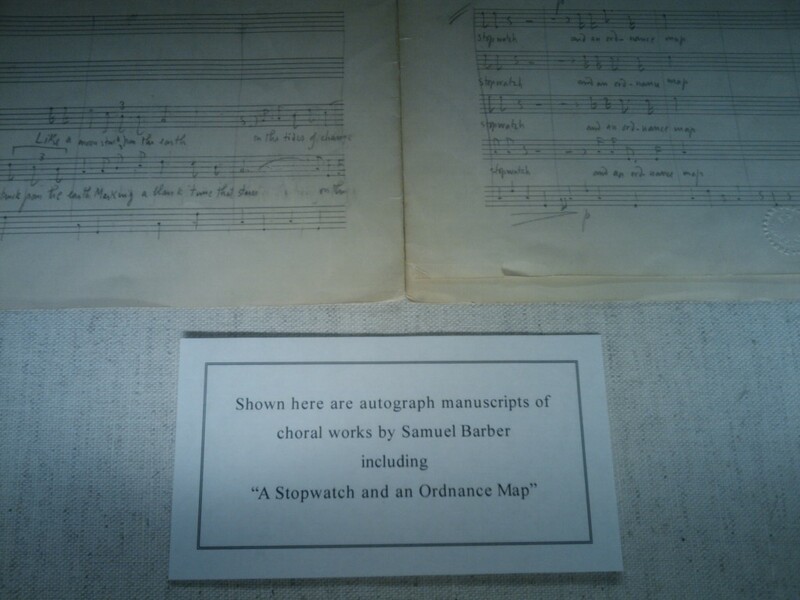 It's fitting that this is my very first blog entry at DCArtsBeat.com (aside from its introduction), because Woodley's concert focused on the music of my favorite composer for all time, Samuel Barber. The repertoire included rare performances from his opus, including the only recently published adaptation of the Gerard Manley Hopkins poem God's Grandeur. And Sure on this Shining Night, melodramatic as it is, ranks to me as among the most moving vocal works to have ever been notated (and Woodley's choral version of the work, normally for soprano with piano accompaniment, elicited fresh sonorities). The occasion to focus on Barber's compositions is part of a recent spate of centenary celebrations of his birth in the past few months; in mid-March, some whiz kids from the Curtis Institute gave an all-Barber concert in the same space, including his aching Dover Beach and a prodigious performance by a 15-year-old of his Piano Sonata which to these ears rivaled the seminal interpretations by John Browning and the pianist for whom the work originally was commissioned, Vladimir Horowitz. Curtis have a special relationship with the composer, since he was part of its first graduating class. One of the most charming, and reliably insightful, traditions at the Coolidge Auditorium Concert Series is to view curated original holographs from the Library of Congress' music division in the lobby's display cases. Here is a picture I snapped of one such score. As mentioned in the introductory posting, one foremost practice of this blog is to recommend (subjectively) definitive physical/virtual media for further study and enjoyment. Since Samuel Barber is not widely appreciated, I can't resist going broad and recommending surely the finest Barber recording ever, right at the end of a seeming golden era when large record companies (like RCA here) were spending good money producing extraordinary recordings. This one, no less, is from the great moment in (our recent own) Leonard Slatkin's career, when he had just gained major presence in the classical music world after long leadership of the St. Louis Symphony Orchestra. In this recording, you can hear the amazing John Browning perform Barber's volcanic Piano Concerto, then hear Browning join with Slatkin on the piano for a performance of Souvenirs, which goes quite the opposite direction stylistically into the swank of parlour music (blending Barber's idiomatic lyrical lines with his occasional chromatic flourishes).